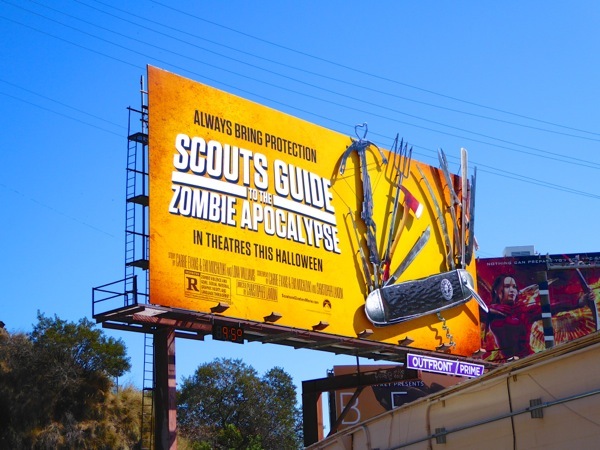 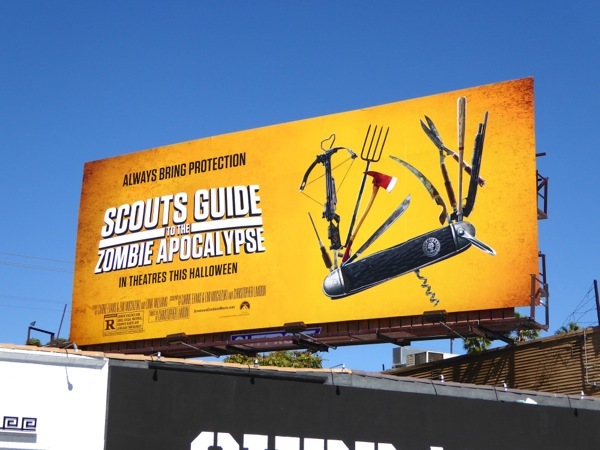 This customised Swiss Army knife creative complete with crossbows, pitchforks, baseball bats and axes is the perfect way to convey the premise of the Halloween movie, Scouts Guide to the Zombie Apocalypse. 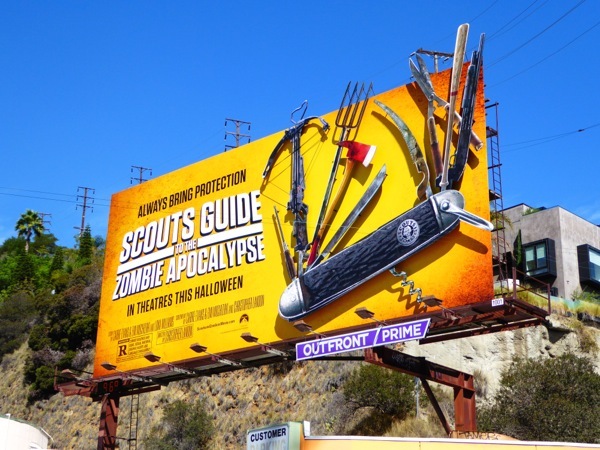 Not only does the creative sport all the weapons for fighting the undead in one handy pocket-sized tool, but it also makes for an incredibly eye-catching billboard, whether it has special extension embellishments or as a standard ad creative. 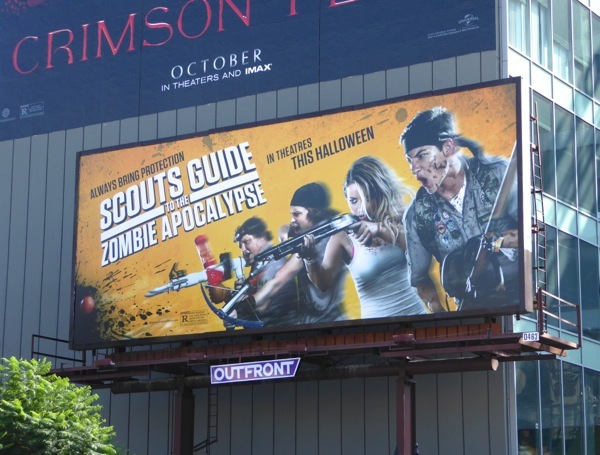 In fact it's far more engaging than this other billboard design featuring the young cast, which let's face it, we've seen before when it comes to the zombie genre. 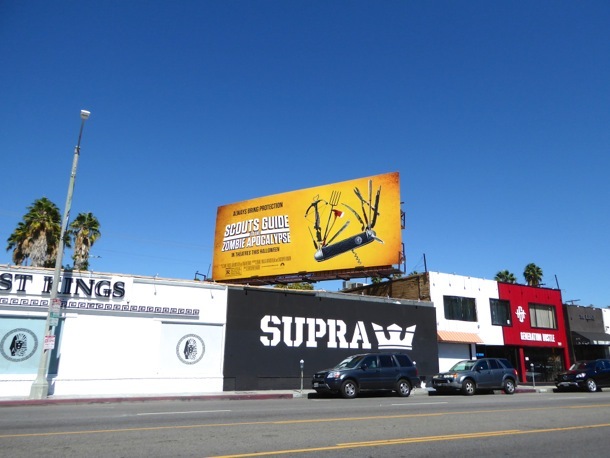 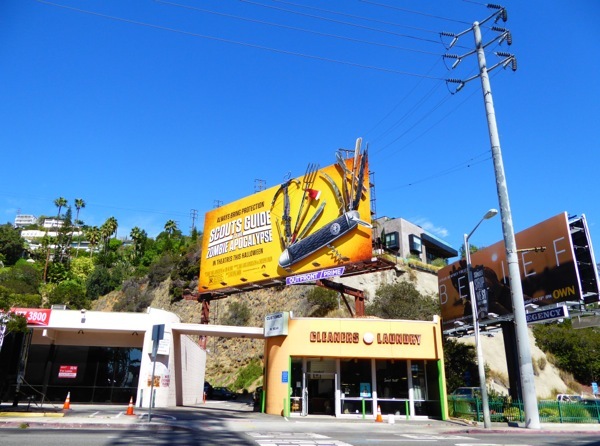 You can't help but notice this special billboard along the Sunset Strip, which was snapped on October 9, whilst the vibrant yellow billboard equally stands out without the 3D enhancement along Melrose Avenue on October 11, and the cast version was spied on October 17, 2015 along Hollywood's busy Highland Avenue. 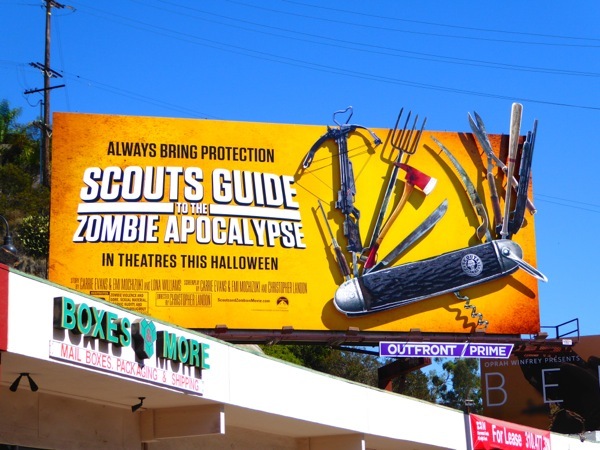 As the film's title suggests, three boy scouts (Tye Sheridan, Logan Miller and Joey Morgan) on the eve of their last camp out have to save themselves and their town from an apocalyptic zombie outbreak, with the help of a local cocktail waitress (Sarah Dumont) who can more than take care of herself. 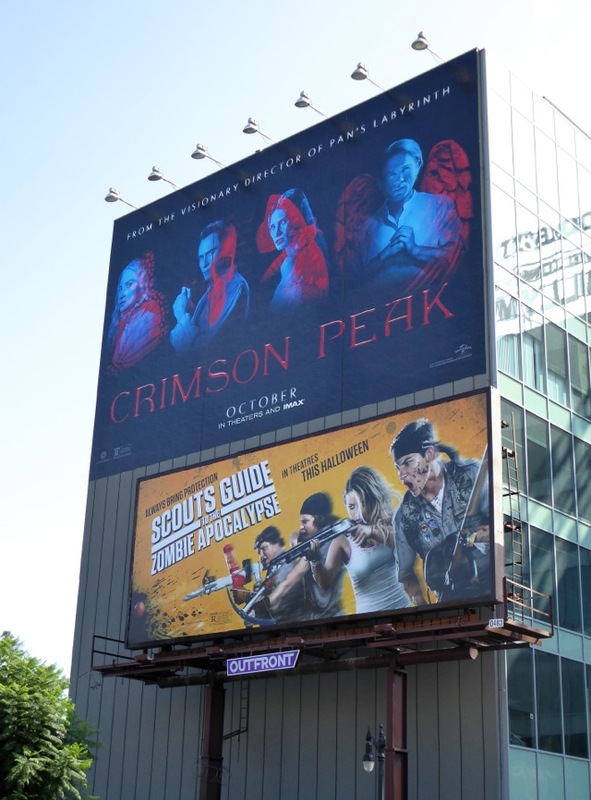 If you're a fan of zombies, be sure to also enjoy these billboards for The Walking Dead, these Universal Studios Halloween Horror Nights billboards and these World War Z movie billboards. 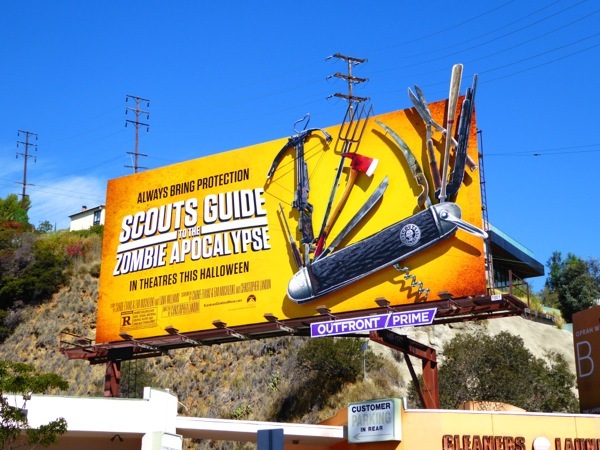 As every scout knows, you should always be prepared, even for the end of the world (just remember to bring protection).